By studying craft breweries across the state of Iowa, this study will investigate how Iowa craft breweries are fostering neolocalism and providing third places for their patrons by appealing to their desire to seek out local ties. It will also investigate how the industry has grown spatially. Here, I will examine Iowa’s strong ties to agriculture, the demographics of the first settlers, population and demographics of the state, its history of brewing, and the locations of breweries throughout the state. Iowa is located in the Midwestern United States. Its eastern border is the Mississippi River and the Missouri River runs near its western border (Figure 1). The geographic location (latitude ranging from 40° 36′ N to 43° 30′ N and it’s interior continental location) allows for distinct seasonal variations (Climate of Iowa ; Iowa Geography from NETSTATE). The state’s average temperature ranges from between 45 to 52 degrees Fahrenheit with July being the hottest month ranging from 61 to 65 degrees Fahrenheit in the mornings to 82 to 87 degrees Fahrenheit in the afternoon. Average precipitation is around 34 inches per year, almost three-fourths of which falls during the growing season which lasts about 162 days, beginning after the last frost in spring, and ending with the first frost in fall (April through September) (Climate of Iowa). Iowa’s population had grown, primarily due to immigration, to 22, 859 and by 1840 the state had 43, 112 residents (Ross 1951) (Table 1). The state’s population was estimated in 2014 to be 314,107,084 with around 72 percent of the population being 21 years of age or older. 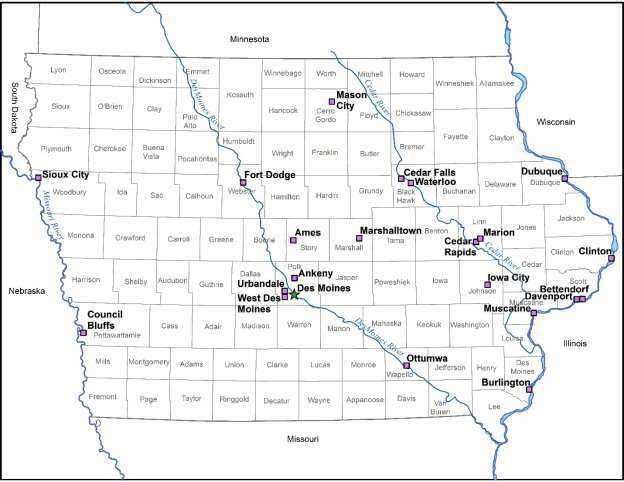 It is divided into 99 counties with the largest city in the state being the capital, Des Moines, with a population of 204,220 followed by Cedar Rapids at 126,326 (United States Census Bureau 2016). Sixty-six open breweries across the state will be investigated. Brewing in Iowa began with the opening of its first brewery in Ft. Madison in 1844; by 1854, there were 27 throughout the state. The Temperance movement began to become popular in the state well before Prohibition so the number of craft breweries rose and fell with the strength of the movement. In 1854, the state passed its first prohibition law. This law failed to be effectively enforced, so by 1858 the state had increased its number of breweries to 42 followed by a further increase to 149 by 1875 (Lipsman, Siegelman, and Otto 2015). In 1880 and 1882, the voters supported laws that made all alcohol, except that sold by pharmacists, illegal in the state. The statewide prohibition lasted until 1893, causing the number of breweries to drop to 28. These laws had many loopholes and were difficult to enforce. Finally, in 1915 and 1917, more prohibition laws were passed resulting in the closing of all breweries in the state (Lipsman, Siegelman, and Otto 2015). Iowa saw the establishment of the first post-Prohibition brewery in Amana in 1985 (Figure 2). By 2015, there were 66 (Figure 3). 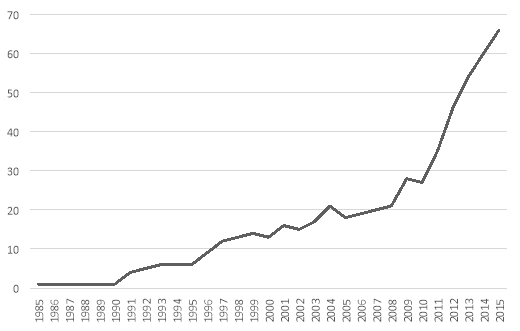 Much of the expansion began after a 2010 (Figure 4) change in state law that allowed the production of high alcohol content beers (greater than 5 percent but less than 12 percent ABW) (Lipsman, Siegelman, and Otto 2015). Climate of Iowa. 2017. National Weather Service [cited 01/28/2017 2017]. Available from http://www.crh.noaa.gov/Image/dvn/downloads/Clim_IA_01.pdf. Iowa Geography from NETSTATE. 2017. 02/25/2016 [cited 01/29/2017 2017]. Available from http://www.netstate.com/states/geography/ia_geography.htm. Lipsman, M., H. Siegelman, and D. Otto. 2015. The Economic Impact of the Craft Beer Industry in Iowa, 1-88: The Iowa Wine and Beer Promotion Board. Peters, D. J. 2011. Iowa Population Over 100 Years, 26: Iowa State University Extension and Outreach. Ross, E. D. 1951. Iowa Agriculture: An Historical Survey. Cedar Rapids, Iowa: State Historical Society of Iowa. Schwieder, D. 2017. History of Iowa. State Library of Iowa 2010 [cited 01/28/2017 2017]. Available from http://publications.iowa.gov/135/1/history/7-1.html. "Creation of Neocolonialism." UKEssays.com. 11 2018. All Answers Ltd. 04 2019 <https://www.ukessays.com/essays/geography/creation-neocolonialism-5191.php?vref=1>. "Creation of Neocolonialism." All Answers Ltd. ukessays.com, November 2018. Web. 23 April 2019. <https://www.ukessays.com/essays/geography/creation-neocolonialism-5191.php?vref=1>. UKEssays. November 2018. Creation of Neocolonialism. [online]. Available from: https://www.ukessays.com/essays/geography/creation-neocolonialism-5191.php?vref=1 [Accessed 23 April 2019]. UKEssays. Creation of Neocolonialism [Internet]. November 2018. [Accessed 23 April 2019]; Available from: https://www.ukessays.com/essays/geography/creation-neocolonialism-5191.php?vref=1.